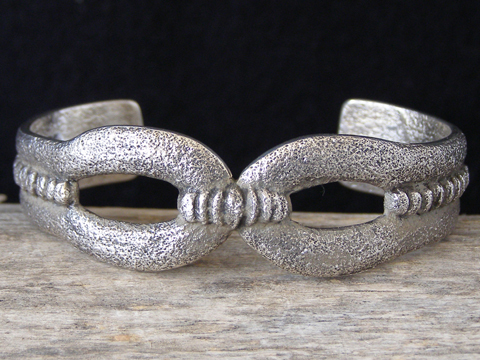 Lee Begay Sandcast Bracelet size 6"
Born in 1970, Lee Begay is the older brother of award-winning Navajo sandcast jewelry artist Darryl Dean Begay. He's learned his craft from his brother Darryl Dean and is now thriving as a silversmith specializing in sandcast jewelry. This cut-out design is an exquisitely simple and beautifully made sandcast design. Luxuriously understated. Signed inside LEE B and marked 14 for 2014 and SS for Sterling Silver. Widest width in front: 3/4"